Department of Neurological Surgery, Columbia University Medical Center, New York, NY 10032, USA. Citation: Yun J, Iwamoto FM, Sonabend AM. Primary Central Nervous System Lymphoma: A Critical Review of the Role of Surgery for Resection. Arch Cancer Res. 2016, 4:2. Primary central nervous system lymphomas (PCNSL) are relatively rare non-Hodgkin’s lymphomas, accounting for 1-2% of primary CNS tumors . The treatment of these tumors, consisting of chemotherapy and in some centers radiation, has evolved over the past decades and remains to be fully optimized, with almost all patients suffering recurrence. Importantly, the role of surgery for resection of these tumors has not been adequately investigated in the current setting, and has been marginalized following negative outcomes from decades-old studies. Most of the studies that evaluate the role of resection predate modern surgical techniques and high-dose methotrexate-based chemotherapy. In this review, we provide a critical overview for the evidence supporting and disregarding the role of resection for PCNSL, and offer a rationale for prospective studies to evaluate the safety and efficacy of cytoreductive surgery for this disease. Surgery for cytoreduction has been adopted as an important component of the standard of care for malignant brain tumors, including gliomas and large brain metastases. In addition to symptomatic relief of mass effect, resection of these lesions is believed to contribute to oncologic control, and provide a survival advantage for selected patients. This paradigm is largely based on observational studies that found correlations between extent of resection of the enhancing lesion and survival [2-5]. Resection has also played an important role for the management of low-grade gliomas, in which case cytoreduction is associated with an overall survival advantage and a delay in malignant transformation [6,7]. Retrospective literature does not provide the best evidence for attributing survival to resection as it is subject to selection and survivorship biases. Patients with better neurological condition, patients with lesions on non-eloquent brain, and patients with higher performance status are more likely to be offered surgery, and independent of resection, might have a better outcome. Moreover in the case of astrocytomas, IDH1 mutation, an established molecular feature with a favorable prognosis is also associated with resectability . A growing number of clinical trials support the role of resection for malignant brain tumors. First, Patchell et al., showed that resection plus radiation leads to improved survival over radiation alone for brain metastases . Also, Stummer et al., showed that 5-ALAbased intraoperative tumor visualization technology improves the extent of resection and is associated with a progression-free survival benefit in the case of malignant gliomas . Vuorinen et al., reported on a clinical trial for elderly glioblastoma patients, in which debulking offered an overall survival benefit compared to biopsy . However, PCNSL remains a diagnosis for which resection is not currently common practice. PCNSL is considered an extranodal non-Hodgkins lymphoma and can occur in both immunocompetent and immunocompromised patients. Patients with this diagnosis often present similarly to those diagnosed with other brain malignancies, and include focal neurologic deficits, neurocognitive symptoms, headaches, seizures, and ocular symptoms. The majority of these tumors are solitary in nature (50-70%), and are usually supratentorial . On MRI, PCNSL typically appear as homogenously enhancing lesions with surrounding edema (Figure 1A). However, the appearance of these tumors on radiology is notoriously similar to other brain malignancies and pathologic diagnosis is usually needed. Although cytology and flow cytometry from cerebrospinal fluid (CSF) can be attempted, these analyses have low-yield for definite diagnosis. Because pathologic diagnosis is required, a stereotaxic needle biopsy of the intracranial mass is the most accepted diagnostic procedure. In fact, recent guidelines now emphasize the importance of tissue diagnosis for PCNSL as opposed to diagnosis by cytological analysis of CSF through a lumbar puncture . 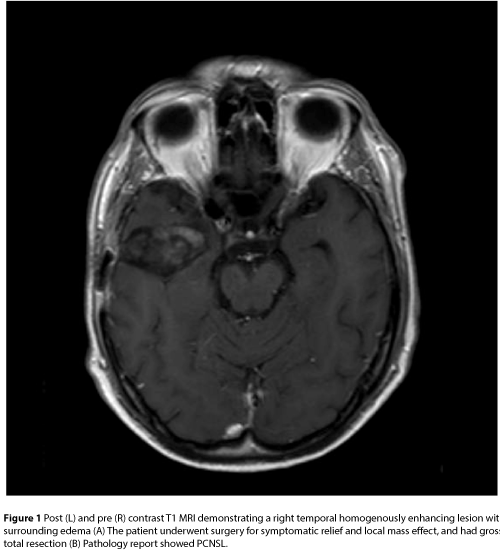 Figure 1A: Post (L) and pre (R) contrast T1 MRI demonstrating a right temporal homogenously enhancing lesion with surrounding edema (A) The patient underwent surgery for symptomatic relief and local mass effect, and had gross total resection. Once the diagnosis of PCNSL is made, the most accepted treatment is high dose systemic methotrexate, but the best combination of drugs and the role of whole-brain radiotherapy are unclear . PCNSL has worse outcomes compared to other systemic or extranodal lymphomas, and an important limitation for progress for PCNSL has been the paucity of tumor tissue available for thorough molecular analysis, as readily done in systemic lymphomas and other CNS malignancies. Occasionally, patients with PCNSL undergo surgical resection as these lesions can mimic other pathology on imaging studies, or in cases of a need for symptomatic relief secondary to severe mass effect, as recommended on the guidelines (Figure 1B). Obtaining an intraoperative pathology consult with frozen specimen is a common practice in brain tumor surgery. In these cases, PCNSL is ruled out prior to continuing with an extensive resection. Whereas there is debate for the optimal regimen for managing these tumors, surgery with a cytoreductive goal has traditionally been abandoned. Figure 1B: Post (L) and pre (R) contrast T1 MRI demonstrating a right temporal homogenously enhancing lesion with surrounding edema (B) Pathology report showed PCNSL. In many non-CNS lymphomas, no current standard treatment strategy exists, and similarly, the role of surgical resection has not been fully investigated. A growing body of evidence demonstrates the potential for improved outcomes and survival in certain systemic lymphomas with surgical resection. For example, in patients with intestinal diffuse large B-cell lymphoma, those treated with surgical resection followed by chemotherapy had improved progression-free and overall survival versus chemotherapy alone . Also, the surgical treatment for pediatric intra-abdominal lymphomas is typically limited to diagnostic laparotomies and chemotherapy. However, in a recent retrospective study with a cohort of patients with intra-abdominal follicular lymphoma who underwent complete resection, the 2-year overall survival was similar for patients with complete resection and a “watch and wait” strategy and those who received chemotherapy without resection . While the inherent risks of surgery and gross total resection in systemic lymphoma differ from PCNSL, these studies highlight the potential benefit of cytoreduction on overall survival. The traditional management of PCNSL has moved away from primary surgical resection for a variety of arguments. A common reason against resection is the diffuse nature of the disease at the time of presentation and diagnosis. Although up to two thirds of the patients present with a single lesion on imaging, microscopic disease is often present beyond the radiographically visible lesion. The histopathology of PCNSL lesions demonstrates that these are diffuse, showing an angiocentric growth pattern, with cuffs of tumor cells around cerebral vasculature. Further, islands of tumor cells can be seen invading into the brain parenchyma [17-19]. Diffuse disease and inaccessible location are additional arguments against PCNSL. PCNSL can be found in eloquent or difficult to access areas such as deep brain structures, making resective surgery in these cases difficult and considerably morbid. The enthusiasm for respective surgery for PCNSL is further attenuated as PCNSL can present with intraocular or leptomeningeal dissemination, and cytoreduction is thought of as futile in this scenario . Further, there is a concern that surgery might create dissemination of tumor cells in to the subarachnoid space . In addition, PCNSL can respond rapidly to corticosteroids and chemotherapy, with eventual resolution of mass effect and neurological symptoms, foregoing the need for debulking surgery. Lastly, most surgeons would recommend waiting for a period after surgery to allow for wound healing, and there is a concern that minor delays in treatment worsen outcomes for PCNSL . Due to these considerations, surgical resection with the goal of cytoreduction has not been the primary surgical strategy in the management of this disease. De Angelis et al., 1990  Prospective IIb 29 4 had RT alone, 28 received chemotherapy and RT. Table 1: Studies evaluating the role of resection for PCNSL [28-40]. 1. Most of these reports are post-hoc retrospective analyses of data from studies that were not designed or powered to evaluate the benefit of surgery for PCNSL. 2. The therapeutic benefit of surgery was often evaluated in the absence of standardized chemotherapy, such as concomitant high-dose systemic methotrexate and steroids, making any extrapolation of the findings irrelevant to the current standard of care for these patients. 3. Resective surgery is likely considerably safer than in the past. Technological advancements such as of modern imaging, intraoperative monitoring and navigation techniques, as well as fluorescence-guided microsurgery  allow for resections of brain tumors with reasonable morbidity. Recent results are questioning the non-resective paradigm for PCNSL. Weller et al., investigated the role of resection through a post-hoc analysis of the German PCNSL Group-1 trial, a randomized Phase III study population of 526 patients . This study was designed to investigate the role of whole brain radiation therapy in patients treated with high-dose methotrexate, and therefore, all patients had this chemotherapy regimen . This analysis showed that patients that underwent partial or gross total resection had significant progression-free survival and overall survival benefits compared to those that underwent biopsy (Figure 2). This difference in survival was independent of age or Karnofsky Performance Score (KPS), given that these variables were comparable between groups. Whereas the progressionfree survival benefit remained independent from the number of lesions, the overall survival benefit associated with resection over biopsy was not significant upon controlling for the number of lesions . Interestingly, there was no observed difference in progression-free survival or overall survival between patients who received gross total resection and subtotal resection. While this study was limited as a post-hoc analysis of randomized data, it suggests a survival benefit associated with cytroreductive surgery for PCNSL. However, the fact that the trial was not designed to test the role of surgery and the post-hoc nature of the analysis comprise potential biases. First, patients with low KPS were excluded from the original study, therefore making surgery appear safer . Moreover, patients with multiple lesions had resection less frequently than patients with a single lesion, while number of lesions was a prognostic factor on this study. Yet, the results from this study raise an important question, and provide a justification for investigating the role of resection in a prospective and controlled setting. Figure 2: Progression free survival (PFS) and overall survival (OS) by extent of resection in 526 subjects, analyzed with the Cox regression model. PFS significantly increased in patients with gross or subtotal resection vs. biopsy (p=0.005), no difference seen in gross total vs. subtotal resection (p=0.023). OS improved for both gross total resection alone and gross or subtotal resection vs. biopsy (p=0.024). No difference in OS seen between gross and subtotal resection (p=0.297). The most recent study published examining the possible benefit of surgical resection in PCNSL is a 10-year retrospective series of 27 patients, with 12 undergoing total tumor resection, with all patients receiving high dose methotrexate. Patients who received complete resection had a significantly longer overall survival compared to partial resection or biopsy only patients (Figure 2) . Although this study was limited by its small sample size, retrospective nature, and lack of reported complications, it suggests that a potential benefit for gross total resection in PCNSL exists. Recent guidelines published for immunocompetent patients with PCNSL recommended surgery for large, compressive lesions; however no consensus could be reached regarding the use of surgical resection for solitary, accessible lesions . This highlights the paucity of high-quality data to address this question, especially in the era of modern neurosurgical techniques and widely accepted chemotherapy. The treatment paradigm for PCNSL has evolved since the introduction of high-dose methotrexate. Early studies that examined the role of surgical resection for PCNSL were inconclusive, showed a lack of therapeutic benefit, or in some cases even found resection to be associated with worse outcome. Most of these old studies were performed prior to widespread adoption of today’s chemotherapy regimens. Further, it is important to note that high operative morbidity for open resection of PCNSL described on these early studies was in the context of resection that preceded the wide spread use of MR imaging, neuro-navigation and fluorescence-guided surgery, techniques that have improved the safety in current neurosurgical practice [28-40]. Recent data suggests that there might be a therapeutic benefit for resection of PCNSL, but this evidence is subject to biases, and should be interpreted with caution. Further, with growing evidence in cases of systemic lymphoma that demonstrate survival benefit with cytoreduction, the role of surgery in PCNSL should be reconsidered. In this context, there is a need for prospective studies to investigate the safety and therapeutic benefit of cytoreductive surgery for PCNSL. This work was supported by the NIH Office of the Director DP5OD021356-01 (A.M.S) and Columbia University Provost Diversity Faculty Recruitment Award (A.M.S). Lacroix M, Abi-Said D, Fourney DR, Gokaslan ZL, Shi W, et al. (2001) A multivariate analysis of 416 patients with glioblastoma multiforme: prognosis, extent of resection, and survival. J Neurosurg 95: 190-198. Laws ER, Parney IF, Huang W, Anderson F, Morris AM, et al. (2003) Survival following surgery and prognostic factors for recently diagnosed malignant glioma: data from the Glioma Outcomes Project. J Neurosurg 99: 467-473. Brown PD, Maurer MJ, Rummans TA, Pollock BE, Ballman KV, et al. (2005) A prospective study of quality of life in adults with newly diagnosed high-grade gliomas: the impact of the extent of resection on quality of life and survival. Neurosurgery 57: 495-504. Jakola AS, Myrmel KS, Kloster R, Torp SH, Lindal S, et al. (2012) Comparison of a strategy favoring early surgical resection vs a strategy favoring watchful waiting in low-grade gliomas. JAMA 308: 1881-1888. Duffau H (2013) A new philosophy in surgery for diffuse low-grade glioma (DLGG): oncological and functional outcomes. Neurochirurgie 59: 2-8. Beiko J, Suki D, Hess KR, Fox BD, Cheung V, et al. (2014) IDH1 mutant malignant astrocytomas are more amenable to surgical resection and have a survival benefit associated with maximal surgical resection. NeuroOncol 16: 81-91. Patchell RA, Tibbs PA, Walsh JW, Dempsey RJ, Maruyama Y, et al. (1990) A randomized trial of surgery in the treatment of single metastases to the brain. N Engl J Med 322: 494-500. Stummer W, Pichlmeier U, Meinel T, Wiestler OD, Zanella F, et al. (2006) Fluorescence-guided surgery with 5-aminolevulinic acid for resection of malignant glioma: a randomised controlled multicentre phase III trial. Lancet Oncol 7: 392-401. Vuorinen V, Hinkka S, Farkkila M, Jaaskelainen J (2003) Debulking or biopsy of malignant glioma in elderly people - a randomised study. ActaNeurochir (Wien) 145: 5-10. Bataille B, Delwail V, Menet E, Vandermarcq P, Ingrand P, et al. (2000) Primary intracerebral malignant lymphoma: report of 248 cases. J Neurosurg 92: 261-266. 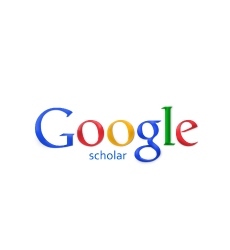 Hoang-Xuan K, Bessell E, Bromberg J, Hottinger AF, Preusser M, et al. (2015) Diagnosis and treatment of primary CNS lymphoma in immunocompetent patients: Guidelines from the European Association for Neuro-Oncology. Lancet Oncol 16: e322-332. Thiel E, Korfel A, Martus P, Kanz L, Griesinger F, et al. (2010) High-dose methotrexate with or without whole brain radiotherapy for primary CNS lymphoma (G-PCNSL-SG-1): a phase 3, randomised, non-inferiority trial. Lancet Oncol 11: 1036-1047. Lee HS, Park LC, Lee EM, Shin SH, Ye BJ, et al. (2014) Comparison of therapeutic outcomes between surgical resection followed by R-CHOP and R-CHOP alone for localized primary intestinal diffuse large B-cell lymphoma. Am J ClinOncol 37: 182-187. Attarbaschi A, Beishuizen A, Mann G, Rosolen A, Mori T, et al. (2013) Children and adolescents with follicular lymphoma have an excellent prognosis with either limited chemotherapy or with a "Watch and wait" strategy after complete resection. Ann Hematol 92: 1537-1541. Miller DC, Hochberg FH, Harris NL, Gruber ML, Louis DN, et al. (1994) Pathology with clinical correlations of primary central nervous system non-Hodgkin's lymphoma. The Massachusetts General Hospital experience 1958-1989. Cancer 74: 1383-1397. Lai R, Rosenblum MK, DeAngelis LM (2002) Primary CNS lymphoma: a whole-brain disease? Neurology 59: 1557-1562. Bhagavathi S, Wilson JD (2008) Primary central nervous system lymphoma. Arch Pathol Lab Med 132: 1830-1834. Bierman PJ (2014) Surgery for primary central nervous system lymphoma: is it time for reevaluation? Oncology (Williston Park) 28: 632-637. Reni M, Ferreri AJ, Garancini MP, Villa E (1997) Therapeutic management of primary central nervous system lymphoma in immunocompetent patients: results of a critical review of the literature. Ann Oncol 8: 227-234. Rubenstein JL, Hsi ED, Johnson JL, Jung SH, Nakashima MO, et al. (2013) Intensive chemotherapy and immunotherapy in patients with newly diagnosed primary CNS lymphoma: CALGB 50202 (Alliance 50202). J Clin Oncol 31: 3061-3068. Holdhoff M (2014) Role of surgical resection in primary CNS lymphoma: a resurrected discussion. Oncology (Williston Park) 28: 641-642. Shankar GM, Barker FG 2nd (2014) Primary CNS lymphoma: the role of resection. Oncology (Williston Park) 28: 637-642. Grossman R, Nossek E, Shimony N, Raz M, Ram Z (2014) Intraoperative 5-aminolevulinic acid-induced fluorescence in primary central nervous system lymphoma. J Neurosurg 120: 67-69. Henry JM, Heffner RR, Dillard SH, Earle KM, Davis RL (1974) Primary malignant lymphomas of the central nervous system. Cancer 34: 1293-1302. Jellinger K, Radaskiewicz TH, Slowik F (1975) Primary malignant lymphomas of the central nervous system in man. Acta Neuropathol Suppl Suppl 6: 95-102. Berry MP, Simpson WJ (1981) Radiation therapy in the management of primary malignant lymphoma of the brain. Int J Radiat Oncol Biol Phys 7: 55-59. Pollack IF, Lunsford LD, Flickinger JC, Dameshek HL (1989) Prognostic factors in the diagnosis and treatment of primary central nervous system lymphoma. Cancer 63: 939-947. Murray K, Kun L, Cox J (1986) Primary malignant lymphoma of the central nervous system. Results of treatment of 11 cases and review of the literature. J Neurosurg 65: 600-607. DeAngelis LM, Yahalom J, Heinemann MH, Cirrincione C, Thaler HT, et al. (1990) Primary CNS lymphoma: combined treatment with chemotherapy and radiotherapy. Neurology 40: 80-86. Hayakawa T, Takakura K, Abe H, Yoshimoto T, Tanaka R, et al. (1994) Primary central nervous system lymphoma in Japan--a retrospective, co-operative study by CNS-Lymphoma Study Group in Japan. J Neurooncol 19: 197-215. Davies KG, Cole GC, Weeks RD (1994) Twenty-year survival following excision of primary CNS lymphoma without radiation therapy: case report. Br J Neurosurg 8: 487-491. Tomlinson FH, Kurtin PJ, Suman VJ, Scheithauer BW, O'Fallon JR, et al. (1995) Primary intracerebral malignant lymphoma: a clinicopathological study of 89 patients. J Neurosurg 82: 558-566. Sonstein W, Tabaddor K, Llena JF (1998) Solitary primary CNS lymphoma: long term survival following total resection. Med Oncol 15: 61-65. Caroli E, Acqui M, Ferrante L (2004) Primary cerebral lymphoma: a retrospective study in 22 immunocompetent patients. Tumori 90: 294-298. Bellinzona M, Roser F, Ostertag H, Gaab RM, Saini M (2005) Surgical removal of primary central nervous system lymphomas (PCNSL) presenting as space occupying lesions: a series of 33 cases. Eur J Surg Oncol 31: 100-105. Sackett DL (1989) Rules of evidence and clinical recommendations on the use of antithrombotic agents. Chest 95: 2S-4S.